By the time we hit Paris, well into the second week of our trip to France, Tony was starting to figure things out. True, we hadn’t spent an afternoon in an art museum or playing pentanque yet, but Tony’s assessment seemed right to me. The French are obsessed with their next meal. How else would you explain the 3-pound cans of foie gras we saw in grocery stores? Tony, a very light drinker who limits himself to the occasional Budweiser Light or a splash of aged Scotch or Bourbon, became an oenophile specializing in complex, dry roses. He drank with gusto and bought bottles in grocery stores for our dear friend and host, Linda, who I blame for this new crush. When we got to Paris, he ordered glasses and pichets of Cotes de Provence with dinner. Unfortunately (fortunately?) we couldn’t bring back a case or two because of security restrictions. We were limited to dry foods, so I carted home risotto with sliced truffles, two jars of truffle salt, a jar of piment d’espelette from Linda (it’s ground hot red pepper), licorice-flavored Ricola cough drops, chocolate for my sister and two bags of stubby French air-dried sausages for our beloved mutt, Oscar. The best meal we had was the welcome dinner cooked by Linda at her utterly charming 14th- (15th? 16th?) century home in Homps: pastry-wrapped Camembert with salad, winey lamb shanks, and an heroic platter of cheeses. She cooked like crazy the whole time we were there and also was responsible for our most fortuitous discoveries, chief among them a sweet cream butter studded with large grains of sea salt. Wowee. 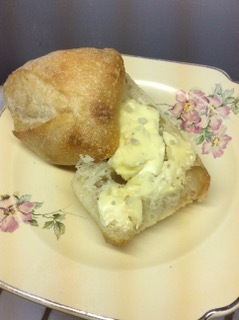 If I let myself, I could eat a half-pound on a baguette for lunch, no problem. At home I’ve already attempted to duplicate the product by partially softening 8 ounces of the best butter I could find while jet-lagged (Kerry Gold) and sprinkling it with 1 1/2 teaspoons of large-chunk (gros) sea salt while smearing the butter on a cold marble surface. Then I scraped the butter back into a block and chilled. Yum. If you try this (and you should), the salt chunks should be distinct and noticeable but not overwhelming. The butter should taste sweet, not salty, each grain a surprise. One or two grains of salt per teaspoon of butter is about right. Other discoveries ranged from the prunes d’Agen (extra-plump and fruity local prunes) I mentioned last week to a delicious rolled turkey thigh roast, which Linda’s butcher makes and Linda seasons and grill-roasts until the skin is crisp and the interior juicy. I am sourcing skin-on boneless turkey thighs as we speak. In Paris I suspended my no-sugar rule and had a slice of tarte Normande from Boulangerie Teillet near my hotel on Rue Monge in the 5th arrondissement, voted the best tarte tatin in Paris and featured recently in the New York Times. Eh. Maybe a slice from a whole tart, warmed, would have tasted better than the flat slice I had that looked and tasted like an apple tart with a teaspoon of custard, not an upside-down, caramelized tarte tatin. (Don’t write; I know tarte Normande is slightly different). 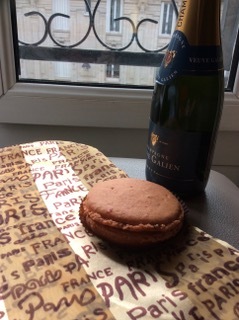 Sugar-wise, I also couldn’t resist a 4-inch strawberry macaron, a small but mighty Portuguese custard tart and, on my last day, a croissant au chocolat. Perhaps the best meal we had in Paris was at Dans Les Landes, a Patricia Wells recommendation that features the foods of Southwest France where we recently had stayed. In Paris, Southwest food means lots of duck — magret breasts pan-fried, duck confit and duck foie gras. I had an interesting appetizer of polenta with duck confit, which was served in a cone as thick batons of cheesy polenta flecked with confit, breaded and deep-fried until crisp. Tony, yearning for Asian food, had seared raw tuna topped with a wispy salad dressed with a French version of Thai seasonings — complex and delicious rather than simple, clean and delicious. We shared a cheese course of paper-thin slices of Gouda embedded with truffles, strewn the length of a narrow wooden paddle. A cold shellfish platter of mussels, whelks, shrimp and raw oysters arranged in a giant shell, with mignonette sauce at Bistro des Copains in Port Leucate on the Mediterranean (Tony had bouillabaisse); ham and Camembert on baguette at Boulangerie Maison Gregoire in Paris; entrecote of beef with green peppercorn sauce and nubbins of fried potatoes drenched in garlic butter, with a green salad, at Bistro du Marche in Paris; Croque monsieur, frozen fries and a green salad at Cafe Opera; miso ramen noodles at Sapporo Restaurant Japonais (I couldn’t fight it); smoked salmon and avocado on a baguette from an unknown boulangerie; miso soup and a California salmon roll from the Sushi Shop (for a picnic by the Seine). Back home, I see that the pumpkin spice craze has not peaked and is in fact reaching crazy new heights this fall. Pumpkin spice potato chips?! I’ll gladly suffer the foolish products, though, if it means inspired items such as Simply Nature Seed You Later Pumpkin bread. This awesome loaf is a chewy yeast bread that, when toasted, tastes like pumpkin pie. Get it at Aldi before autumn gives way to the mad peppermint and ginger season. Speaking of pumpkin bread, this is also the season of batter breads. They are those sweet “breads” leavened with baking powder instead of yeast. I don’t make them because they’re so easy they feel like cheating. Anyway, I don’t see the point. They are no more “breads” than muffins are health food. In fact, batter breads are basically muffins in loaf form. Just ice it and call it a cake, for heaven’s sake. I think I get worked up about batter breads because because giant, un-frosted cupcakes make no sense to me. Or maybe I’m just jealous of people who can treat their friends and family without turning it into an all-day project. Probably the latter. I’m an Akron native now living in Florida. I visit Akron several times a year. One of my favorite things to do is visit West Point Market. I always purchase the Killer Brownies and thumbprint cookies to take back to Florida. I was very disappointed in their recent closing. I am looking for a recipe for their thumbprint cookies. I’ve checked the West Point Market Cookbook with no luck. Do you happen to have a copy of the cookie recipe you could share, or a copycat recipe? Any help would be appreciated. We are ALL disappointed that West Point is no more. The seriousness of this has just started to hit me. Where will I go for cultured butter, caster sugar, block foie gras, a wall of Champagne and advice from a butcher, all under one roof? I have a few West Point recipes and more than a few cloned recipes, but not the one for thumbprint cookies. I never tasted West Point’s version, so I can’t clone it, either. Can anyone else help? P.S. : If anyone has the recipe for West Point’s double (triple?) ginger cookies, I’d kill for it. You’re too kind. It was so much fun having you and Tony here…come back soon.